It starts with a huge battle in a wood in Germany. It’s Roman times, and there are shields and arrows and things on fire, and all sorts of stuff. It’s ace. There’s almost fifteen minutes of awesome fighting, with some boring slow-motion bits with dominating, dramatic music. And then they all start talking. Yawn. Actually, I was well and truly surprised that I enjoyed this film. Years ago, I started watching it and turned it off with disgust. I’m not sure what I was thinking. I certainly don’t think it was worth all the awards that it gained when it was released, but it also was not a total stinker. It’s worth watching it for Joaquin Phoenix alone – he is so magnificently evil as the bad guy. Here’s a bad character that doesn’t set out to be evil, but is thwarted in so many of his attempts to be a great man that he ends up destroying himself. Surprise yourself – if you, like me, refused to watch this because of the reputation that it has gained in your mind, give it another go. Clear your mind of expectations and just enjoy a good story. 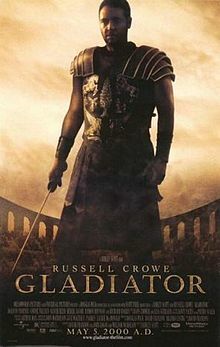 Gladiator won Oscars for Best Picture, Best Actor (Russell Crowe), Best Visual Effects, Best Costume design and Best Sound and was nominated for a further seven Oscars including Best Supporting Actor (Joaquin Pheonix) and Best Director (Ridley Scott).